–Do French Kids eat better than American kids? My response, on the Wall Street Journal’s Speakeasy Blog. -Three fun recipes from French Kids — yum! Curing picky eating, with a French twist: article in the Toronto Star. Thoughtful op-ed article from Harvard’s Dr Jennifer Cheng in the Journal of the American Medical Association. Can French Food Rules change the way you feed your toddler? Joanna Goddard from a Cup of Jo weighs in with a review of French Kids…and generates lots of great comments. –Interview with Steve Paulson at Wisconsin Public Radio‘s To the Best of Our Knowledge radio show. A sneak peak at the book and one of my favourite recipes! -Fun interview with Dina Pugliese on Breakfast Television. Look at that lovely meal they prepared! –Global TV interview: Should you be teaching your kids to eat like the French? -In-depth interview with Fanny Kiefer on Studio 4: Part 1 (our story) and Part 2 (some funny stories and some French food rules). -“French Kids Don’t Snack: Surprising Food Habits from Abroad” on Babble.com. -Thanks to Parenting.com for another excerpt! –Thoughtful discussion (France, child rearing, the core messages of French Kids, and more) on 49th Shelf with The Book Madam. -Chef and writer Michael Ruhlman was inspired by French Kids to write this post on ‘culinary intelligence as an emerging trend’, in which he describes the US as a country ‘hungry for good, delicious choices’ — there’s room for hope! –French Food Rules – could they work here at home? Savvy thoughts from Out of the Box Food. -Thoughtful review on the Yummy Mummy Club blog. -Thanks to Sarah Wu for the invitation to discuss my experience writing French Kids, on her Fed Up with Lunch blog, which inspired my French Kids’ School Lunch project! 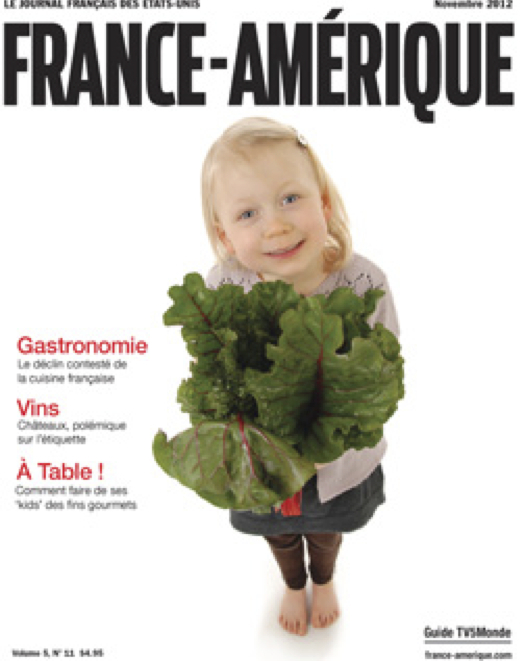 -Thoughtful discussion of French Kids Eat Everything: food culture, nutrition advice for parents, and more by BC-based food writer Don Genova. -Q & A on the website of someone I greatly admire, Robyn O’Brien — her Allergy Kids Foundation is worth checking out. -Fun review and great interview podcast with Amber Strocel (who says she was originally skeptical, but then won over to the French Kids’ approach — I love it!). –Sweet Potato Chronicles Fun profile and book excerpt on one of my favourite family food blogs. -Great review on MommaCuisine, a fellow Jamie Oliver Real Food Advocate! Funniest review so far of French Kids by Hollie Smith. Chapeau! –Radio interview about the broader food politics issues raised by French Kids Eat Everything with Caryn Hartglass on Progressive Radio‘s “It’s all about Food” show. Very proud to have been profiled on the Foodtree blog as a Food Advocate. -First of a two-part series of blog posts on French Kids Eat Everything on The Beauty Mommy blog. Second part of the interview, with some fun observations on food politics. -Thoughtful post on the book on one of my favourite family food blogs: A Family That Eats Together. -Fun review of book on The Stir (by CafeMom) blog. Note: the Food Rules need context in order to fully understand them; in the book they are presented with lots of tips and explanations for putting everything into practice. -Thoughtful comments on the FixMeASnack blog, which perceptively describes the French Kids approach as one as ‘liberation via limitations’! -Sue Atkins (the well-known UK Parenting Coach) invited me to do a guest blog on snacking — hot topic! -Thoughtful post on the negative impacts of short school lunch periods at Amber Strocel’s blog (strocel.com), sparked by her read of French Kids Eat Everything. Read the post here. A sneak peek of French Kids Eat Everything from the book illustrator–and phenomenal artist–Sarah Jane Wright. –Why do French kids eat so well? Rules! Review on “Outside the Box”, an Italian food blog with a Canadian twist! -Last but certainly not least, many thanks to Rosie Pope for hosting a fun book reading & signing at the her Maternity Store in New York on April 3rd!